Northfield, Massachusetts: New England Central Timeless Monochrome? 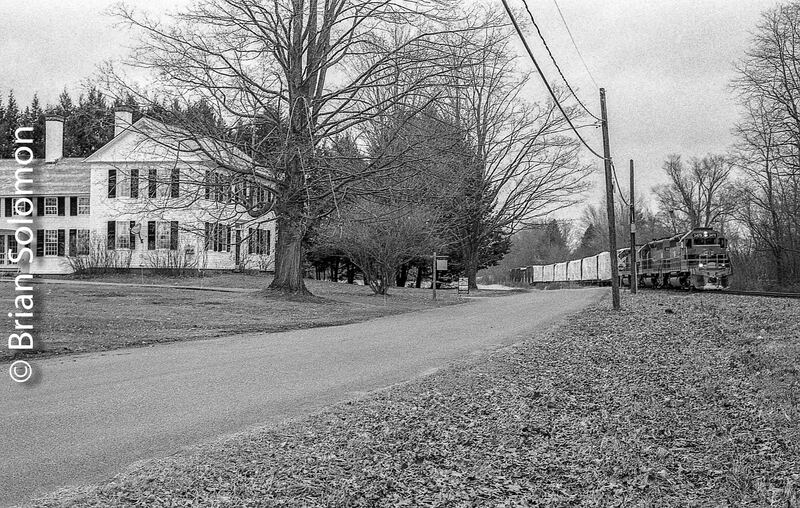 Last week on a trip along the Connecticut River Valley with fellow photographer Mike Gardner, I exposed this view of New England Central job 611 at Northfield, Massachusetts. Exposed on Ilford HP5 using a Nikon F3 with a Nikkor f1.8 50mm lens. Film scanned using an Epson V500 flatbed scanner. Negatives adjusted using Lightroom. Irish Rail Heuston Monochrome—September 2017. Using my old battle-worn Nikon F3T (yeah, that one) fitted with a 1960s-era Nikkor f.14 50mm lens, I exposed a sequence of images in the evening light at Irish Rail’s Heuston Station in Dublin. I was especially pleased with this view of one of Irish Rail’s Mark 4 sets beneath the train shed. Low light made for contrasty silhouette with lots of texture and exceptional dynamic range. 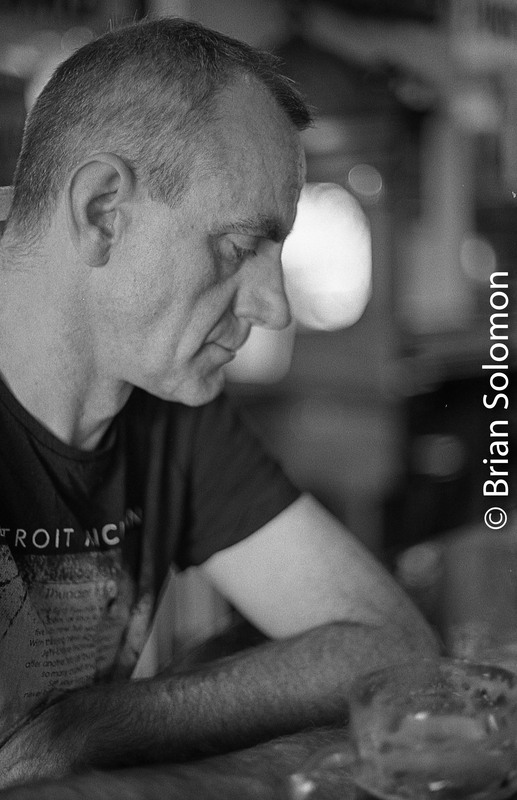 This was exposed on Kodak Tri-X (black & white negative film) using a fairly wide aperture. During early October 2017, I processed the film using two-stage development, initially soaking the film in an extremely dilute mix of Kodak HC110 designed to begin development while allowing great shadow detail and greater overall tonality. For my primary development, I used Ilford ID11, diluted 1-1 with water for 8 minutes at 68 degree F. This was followed by a 30 second stop bath and two fixer baths, 1st rinse, hypo-clear batch, 2nd rinse, then 8 minutes in a weak bath of selenium toner (1 to 9 with water), 10 minute final rinse and drying. I scanned the negatives using an Epson V500 flatbed scanner, with some very nominal final adjustment using Lightroom. Although my digital cameras feature black & white modes, and I can easily de-saturate a digital file to make a monochrome image, I don’t feel that digital imaging would yield a completely comparable image to this one made the old fashioned way. New Photos on Tracking the Light’s Dublin Page. Click on this link to see Tracking the Light’s Dublin Page. 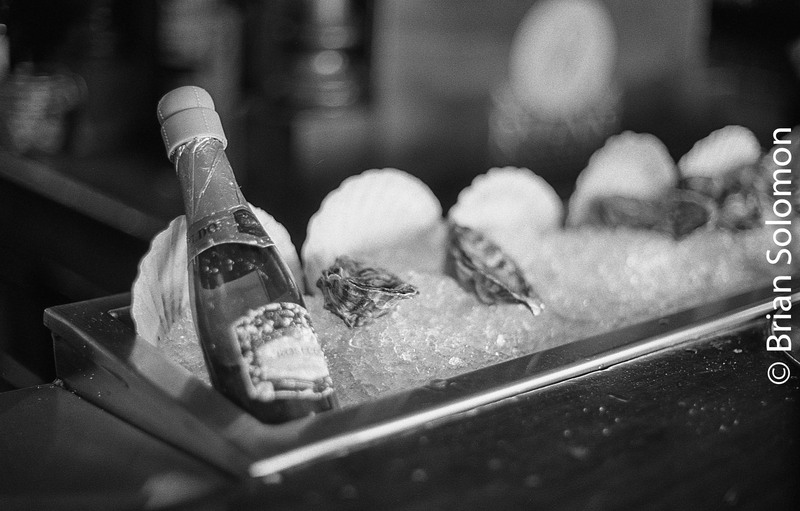 This most recent batch were exposed using a Nikon F3 with 50mm f1.4 lens. Brian Solomon’s Tracking the Light posts new material every day. Grattan Bridge, Dublin. 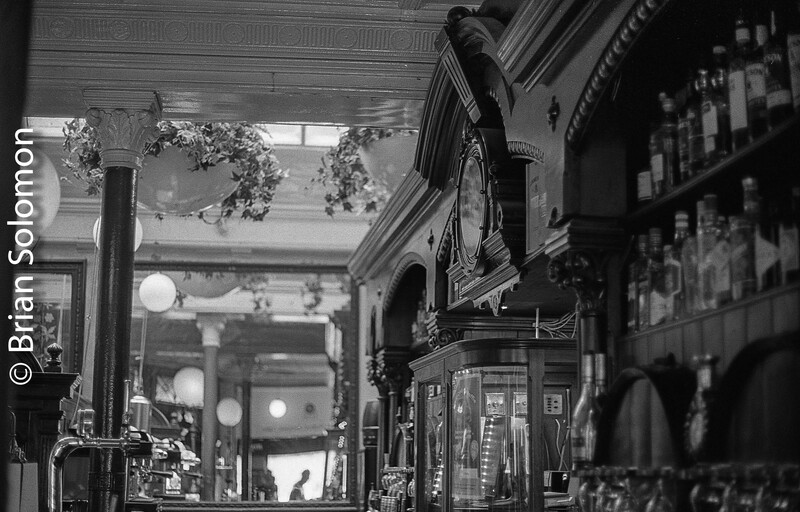 Ilford HP5. Irish Rail’s Connolly Station—April 1998. I exposed this view at Dublin Connolly Station in April 1998 using a Nikon F2 fitted with a Nikkor f2.8 135mm lens and loaded with Ilford HP5 black & white negative film. Ilford HP5 is a 400 ISO emulsion. I processed this roll in Kodak D76 1:1 with water. 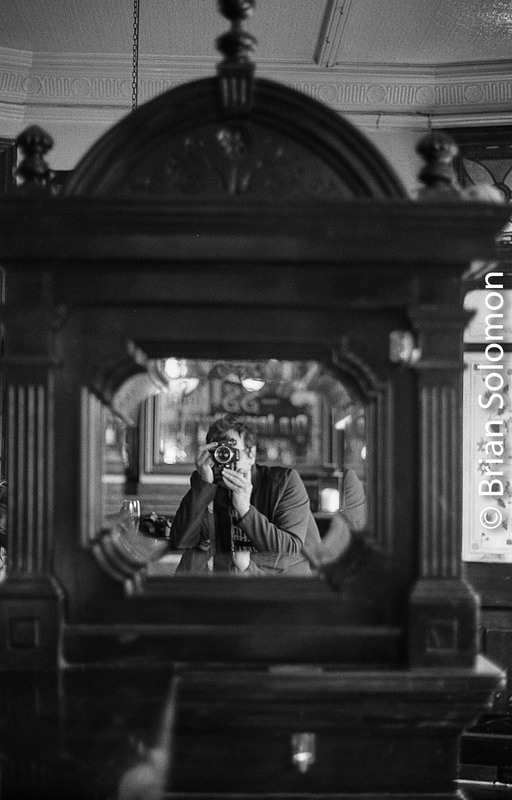 Today, I still occasionally use HP5, but now I’d opt to process it in HC110, which I find gives it a broader tonality and softer grain. This image was scanned from the original 35mm negative using an Epson V600 flatbed scanner and then adjusted using Lightroom. 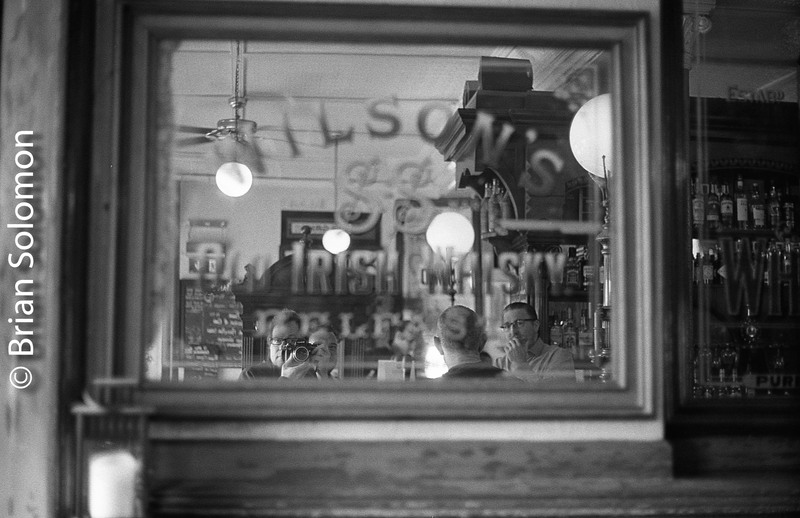 The day was a characteristically bright overcast, a typically Irish day with lighting well suited to Ilford black & white. Tracking the Light posts every day; sometimes twice! From my classic Kodachrome file: it was on the evening of April 19, 1995 that I made this photo of a pair of Chicago & North Western GP9s assembling their train at Jefferson Junction, Wisconsin for the run up to Clyman Junction. I used a low angle, but using my Nikkor 35mm perspective control (pc) lens, I adjusted the front element to hold the vertical lines in parallel, thus avoiding the unnatural looking parallax effect. Exposed on Kodachrome 25 slide film using a Nikon FT3 with 35mm pc lens. C&NW was just weeks away from being absorbed by Union Pacific. It was the end of an era. Hard to believe it was really 20 years ago! A Look at the Final Beet Season. Venerable four wheel beet wagons are fully laden with freshly harvested sugar beet at Wellingtonbridge in December 2005. Exposed with Nikon F3T with 180mm lens on Fujichrome. Between September and January Irish Rail moved sugar beet from a loading facility at Wellingtonbridge to a processing factory in Mallow county Cork. In the last beet season, six days a week Wellingtonbridge loaded six to seven trains. This was Irish Rail’s most intensive freight operation and operated with a fleet of ancient looking four-wheel beet wagons. Short sidings at Wellingtonbridge required the shunting of most laden trains. On this frosty clear autumn afternoon, I made a variety of images on Fujichrome with my Nikon F3T to capture the atmosphere of this operation. What sticks in my mind were the background sounds of conveyors dumping freshly harvested beet into the old wagons and the signal cabin with its mechanical signals and Victorian-era electric staff machine and bells. The scene is all quiet today. Irish Rail locomotive 072 (built by General Motors in La Grange, Illinois.) shunts sugar beet wagons to assemble a train destined for Mallow. The loading equipment is behind the engine. Irish Rail 072 during shunting maneuvers at Wellingtonbridge. The short four-wheel wagons made for uniform looking trains. Cross lighting these wagons offered a ‘picket fence’ effect that I’ve always found appealing in railway images. The beat is dead, long live the beat! DAILY POST: A Tram Navigates the Streets of Poznan. I exposed this image in Poznan on Fujichrome Sensia 100 using my Nikon F3T with 24mm lens. Although the sky was dull, I felt the lighting suited the scene. Moments after I exposed this slide, I boarded the tram and rode to a bleak austere junction in the outskirts of Poznan. The thrill was not in my destination, but in getting there (and back again.) I went out on the No.1 and came back on the No. 7. For me the most difficult part of the journey was figuring out where to obtain tram tickets! I was visiting Poland for the first time in May 2000. While part of the inspiration for my trip was to investigate steam operations at Wolsztyn and elsewhere, I also spent time wandering around cities in the western part of the country. One morning, I explored Poznan, where I found an extensive electric tram system. The old part of the town had cobble stone streets and interesting architecture, while the post-war outskirts featured rows of austere monolithic high-rise apartment blocks. I only rode a few of the tram routes, but my literature indicates that network extended for some 56 route miles. The tram pictured here is a standard Polish Konstal car of a type common to many Polish cities. For me, Poland was like finding an unexplored realm, full of railways with something new at every turn. Over the last decade, I’ve made several subsequent trips to Poland, and numerous excursions across eastern Europe. DAILY POST: Illinois Central, Woodrest Shops, October 1995. The late Mike Abalos and I attended Illinois Central’s public open house on October 8, 1995. This was a well attended event. Illinois Central open house October 8, 1995. Kodachrome 25 slide exposed with a Nikon F3T with 105mm lens. Among the highlights was the railroad’s brand new SD70 number 1000 with its cab open for public inspection. Also on display was the railroad’s business train with former Burlington E-units. The IC business train must have been one of the most secluded executive trains. Not only was this the only time I saw it, but I’ve seen relative few photographs of it on the move. It’s livery was an impressive application of a monochromatic design. Although it was overcast that day, I worked with Kodachrome 25 in my Nikon F3T. When exposed properly, K25 could produce a well rendered image on dull days. I also had Fuji Provia 100 in my Nikormat FT3. Both cameras allowed me to expose some interesting photos of the event. Illinois Central executive E unit on October 8, 1995. Kodachrome 25 slide exposed with a Nikon F3T with 105mm lens. Illinois Central’s executive train on display at Woodcrest Shops on October 8 1995. Exposed on Fujichrome Provia 100 slide film. Notice that the Fuji film did a better job than Kodachrome rendering detail in the overcast sky. Illinois Central business car. Kodachrome 25 slide film with 28mm lens. Westward Freight Descends Donner Pass. A westward Southern Pacific freight led by SD45 7422 negotiates the curves on the west slope of California’s Donner Pass at the railroad location known on the timetable as Yuba Pass (and on Interstate-80 as ‘Yuba Gap’). This was exposed on a Kodachrome 25 slide film at 4:25 pm October 4, 1992. On October 4, 1992, Brian Jennison and I gave a Donner Pass tour to a pair of Union Pacific officials visiting from Omaha. We started the morning early and drove to Andover on fire roads to witness a westward freight climbing through the curves in Cold Stream Canyon west of Truckee. Later we went up to Troy on the west slope and made an inspection of the Cascade Bridges. Southern Pacific was busy that day. My notes indicate that we photographed nine trains, including Amtrak 5 and 6 (California Zephyrs). At 3:40pm we caught this westward freight near Donner Summit at the snow sheds in Norden, California, then followed it west to Yuba Pass. I climbed to the top of a hill over looking the line and exposed a sequence of Kodachrome slides with my Nikon F3T fitted with a f4.0 200mm lens mounted on a Bogan 3021 tripod. This slide was exposed at f4.5 1/250th of a second. (I bracketed up and down 1/3 stops to insure I made an optimally exposed slide). Check out earlier Southern Pacific posts: Donner Pass Part 1, Southern Pacific SD45 at Old Gorge on Donner Pass, July 1990, Southern Pacific’s Roseville Yard, February 1990, and Southern Pacific SD45s on Kodachrome. East Broad Top near Sideling Hill Tunnel, September 1996. View of a Line 40 Years after Closure; Abandoned but not Lifted. Pennsylvania’s East Broad Top is among the most fascinating railways in the eastern United States. Largely built in the 1870s to tap coal fields in the Broad Top region, it was constructed to the three-foot gauge standard and remained that way until closed to traffic in 1956. I exposed this photograph with my Nikon F3T on Fujichrome Provia 100F near East Broad Top’s Sideling Hill Tunnel. A short segment at Orbisonia operated steam excursions from 1960 until 2011, but the remaining portions of the railroad have sat derelict in the mountains since it closed as a common carrier. Although unused, much of the track remained in place. Especially interesting were the tunnels at Sideling Hill and Wray’s Hill. In September 1996, Thomas M. Hoover and I made a project of exploring EBT’s disused lines and facilities. I also made several trips to photograph the railroad’s excursions. On Assignment, Eight Years Ago Today. View from Delaware-Lackawanna’s westward PT97 at the Delaware Water Gap, west of Slateford Junction, Pennsylvania on October 14, 2005. Exposed on Fujichrome with a Nikon F3T and 24mm lens. In October 2005, I arranged through official channels at Genesee Valley Transportation to ride Delaware-Lackawanna’s trains PT98/PT97, and interview railroaders about their work as part of research for my book Working on the Railroad (published by Voyageur Press in 2006). On the morning of October 13, 2005, I joined the crew in Scranton for their run to Slateford Junction near Portland, Pennsylvania. After a bit of switching we were on the road. The weather started out dark and damp, and didn’t improve any throughout the day. The primary emphasis of my trip was the crew and many of my photographs from the day depict engineer Rich Janesko and conductor Shawn Palermo at work. These were featured in the book. On the return run, I opted to ride in the second locomotive for a little while to make images of the train climbing west through the Delaware Water Gap on the former Delaware, Lackawanna & Western mainline. It was on this section that my father had photographed Erie-Lackawanna’s Phoebe Snow more than 40 years earlier. We departed Slateford Junction in early evening. I exposed this image from the fireman’s side of former Lehigh Valley Alco C-420 number 405. Leading is a former Erie-Lackawanna C-425 (running back on home rails thanks to GVT’s policy of Alco acquisition). I used my Nikon F3T with an f2.8 24mm lens mounted firmly on a tripod in the cab and set the shutter speed at between ¼ and 1/8th of a second to allow the trees and ground to blur. I was trying to emulate the effect that Richard Steinheimer achieved on his famous cab ride photos at night in a Milwaukee Road ‘Little Joe’ electric. View from Delaware-Lackawanna’s westward PT97 at the Delaware Water Gap, west of Slateford Junction, Pennsylvania on October 13, 2005. Exposed on Fujichrome with a Nikon F3T and 24mm lens. East Deerfield Yard, October 12, 2004. Low Sun at a Hackneyed Location—Nine Years Ago Today. On the evening of October 12, 2004, I exposed this photograph from the popular ‘waste too much film bridge’ at the west-end of Guilford’s East Deerfield, Massachusetts yard. I’ve made hundreds, if not thousands of images over the years from this spot. I’m not alone. I exposed this on Fujichrome with a Nikon F3 fitted with a Nikkor f2.8 24mm lens. I’d followed a local freight (ED-4?) from the Hoosac Tunnel east on the old Boston & Maine Fitchburg line. This was the locomotive from the local. Having dropped its train in the yard, it has come to the west end and will reverse into the engine house tracks. The shaft of light of the setting sun made for an opportunity. Rather than make a standard view, I opted for this wide angle image that features the locomotive’s high short -hood. This was one of the railroad’s second-hand GP35s noted for this arrangement. (short/long are used to describe the hood length, while high/low the height, thus the contradictory sounding description). The low angle of the sun allowed for light across the front of the locomotive, while the rest of the scene is draped in shadow. You can see the shadow of the bridge I’m standing upon in the distance. Conrail SD80MACs on the Boston & Albany, October 11, 1996. Exposed on Kodachrome 25 color slide film using a Nikon F3T with 28mm Nikkor lens. This was a favorite location of mine on the old Boston & Albany west end. The curve and cutting were built as part of a line relocation in 1912 aimed at reducing curvature and easing the westward climb toward the summit at Washington, Massachusetts. There are several commanding views from the south side of the rock cutting near milepost 129, west of Chester, Massachusetts. My friend Bob Buck had showed me these locations back in the early 1980s, and I’ve made annual pilgrimages ever since. Conrail was still going strong in 1996, although the forces were already in play that would see the line divided between CSX and Norfolk Southern. In less than three years time, this route would become part of the CSX network, and has remained so to the present day. Conrail’s SD80MAC were new locomotives and several pairs were routinely assigned to the B&A grades east of New York’s Selkirk yard. What makes this image work for me is that the foliage has just begun to turn and has that rusty look. Also, the train is descending on the old westward main track, which allows for a better angle. After Conrail reworked the B&A route in the mid-1980s, bi-directional signaling on this section allowed them to operate trains in either direction on either track on signal indication. The result is that moves such as this don’t require unusual attention on the part of either dispatchers or train crews. This photo appeared in my article on Conrail’s SD80MACs that was published in RailNews magazine about 1997. Southern Pacific SD45 at Old Gorge on Donner Pass, July 1990. I spent a lot of time exploring Southern Pacific’s Donner Pass in 1990. Among my favorite locations was ‘Old Gorge’, sometimes referred to as ‘American,’ where SP’s line rides briefly on an open shelf some 2,000 feet above the American River. Southern Pacific SD45 7418 is downgrade on Donner Pass between Midas and Towle, California at the American River overlook in July 1990. Exposed on Kodachrome 25 with a Nikon F3T and 35mm PC ‘Shift’ lens. This offers a stunning view of the American River Canyon, but can be a pretty challenging place to effectively portray a train on film. On this day in July 1990, I’d been following a westward SP freight downgrade, and driven as close to my location as was practical, and then walked to this ledge overlooking the line. The classic whine of dynamic brakes preceded the train by several minutes. I made several exposures as the train came into view. 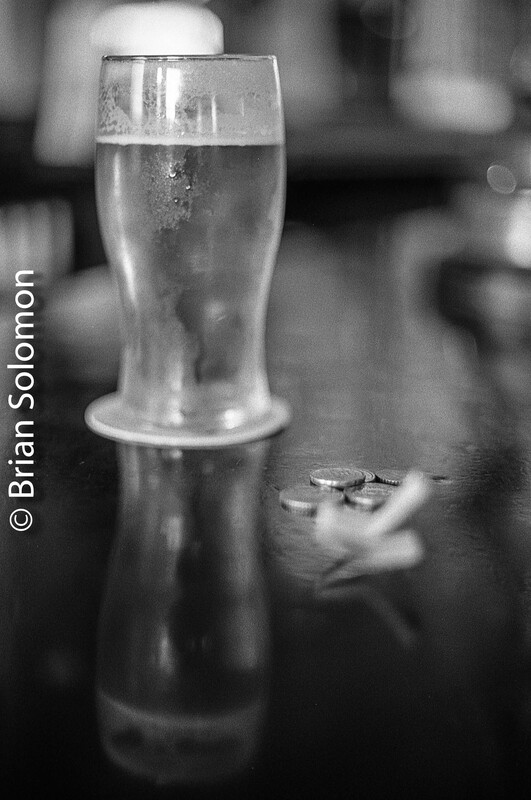 For this image I use my recently acquired Nikon F3T with 35mm perspective control lens. (See recent posts for detail on this equipment: Santa Fe at West Pittsburg, California, November 1990; Metro-North FL9 at Waterbury, Connecticut, November 16, 1992). In this situation, I used the camera and lens handheld, and made a slight adjustment to the shifting element front element. Instead of aiming the camera down toward the front of the locomotive, as I would with a conventional 35mm lens, I aimed toward to the far rim of the canyon, while lowering the front element downward to take in the tracks. As the train passed, I panned the nose of the leading SD45, exposing this frame when it was roughly parallel with the film plane. Since I didn’t have the camera completely level there is still a bit of line convergence, yet the overall view helps put the magnitude of the canyon in perspective with the train without the locomotive appearing too small or seriously distorted. Santa Fe at West Pittsburg, California, November 1990. EMD SD45-2 Under a Blue Dome. I’ve posted this image as another example of my work with a perspective control lens. This was a tool I made excellent use of in the early 1990s. On the recommendation of J.D. Schmid, I bought a Nikon 35mm PC ‘Shift’ lens for my Nikon F3T. Among the advantages of a perspective control lens is the ability to shift the front element. This can be used to keep vertical lines from converging, but also to alter the image in subtle ways. Santa Fe SD45-2 5809 thunders east with a freight at West Pittsburg, California in November 1990. Exposed on Kodachrome 25 film with a Nikon F3T with 35mm PC lens at f4 1/500th of a second. It was a clear Saturday morning in the Bay Area, and Brian Jennison and I were on one of our jaunts looking at area railroads. We stopped near the old station location at West Pittsburg (no ‘h’), California. (I believe the palm trees in the distance are an indication of where the building once stood.) Here we photographed several trains. For this eastward freight, I positioned the camera relatively low to the ground and raised the front element of the 35mm PC to near its maximum. I didn’t quite keep the camera level. The result includes a large amount of crystal blue sky, while minimizing the foreground and keeping the vertical elements of the lead locomotive nearly parallel with the image frame. I feel the subtle effect allows the locomotive visually surge forward, seeming to charge along. This was my intent. Santa Fe 5809 is an SD45-2, a machine powered by EMD’s 3,600 hp 20-cylinder diesel. In their heyday these were powerful machines that produced an awe inspiring low-base sound in the high-throttle positions. I hoped to convey that power visually while making use of the California sky. Metro-North FL9 at Waterbury, Connecticut, November 16, 1992. Vestiges of the old New Haven Railroad. Early dawn light at Waterbury, Connecticut on November 16, 1992. As was typical for the time, I calculated the exposure manually using a Sekonic Studio Deluxe handheld photocell. I made several exposures on Kodachrome 25. I was driving west on I-84 aiming for the Hudson River. It was a bitterly cold autumn morning before dawn and the sky above was a clear blue dome. I made a spot decision, to get off the highway and make a few photos around the old New Haven Railroad station. I exposed this view of Metro-North FL9 2023 with the iconic silhouette of the station’s Italianate clock tower beyond. The locomotive was one of several restored in its as-built 1950s-era New Haven paint scheme. The combination of the early hour and frosty conditions provided for an almost surreal light, but little in the way of personal comfort. Using my Nikon F3T fitted with a 35mm perspective control lens; I composed this view with the camera mounted on a Bogen 3021 tripod with ball head. By keeping the camera level and adjusting the shift on the front element of the PC lens, I kept the vertical elements parallel. I continued my drive west, and the rest of the day was spent productively along the former New York Central Hudson Division between Peekskill and Beacon, New York. Irish Rail, Stacumny Bridge, June 17, 2000. Looking back at a Place Transformed. During my fifteen years in Ireland, few railway locations have changed as much as the area around Hazelhatch. I made this photo of a single 121 leading the empty gypsum train (destined for Kingscourt) on June 17, 2000 from Stucumny bridge. It was my first visit to Stucumny. I was there with Colm O’Callaghan and Mark Hodge, who were well familiar with the spot. It was a Saturday afternoon and there was an air show going on at the nearby Baldonnel Aerodrome. While waiting for the up gypsum we watched the airborne acrobatics. The gypsum traffic left the rails in 2001. Locomotive 128 was cut up in early 2003. 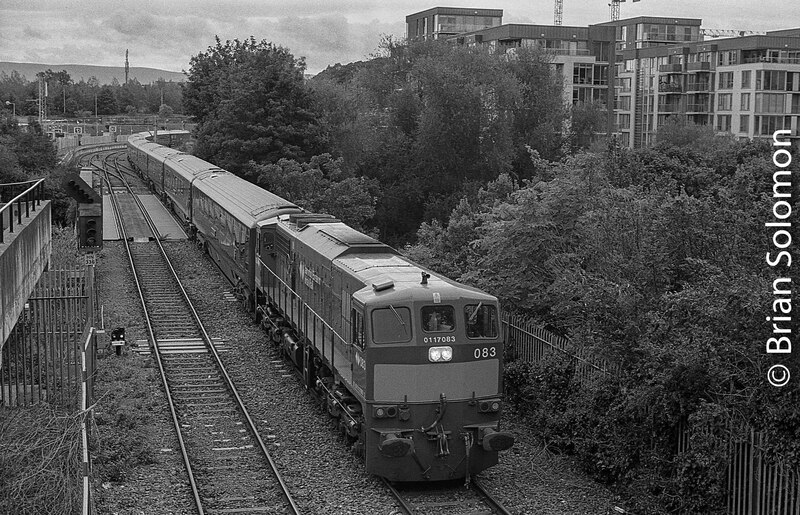 During the late 2000s, Irish Rail added two tracks to the Cork line between Cherry Orchard and Hazelhatch. Cues that link this image with modern ones include the old barn/castle to the right of the tracks and the high voltage electric lines in the distance. I exposed this image with my Nikon F3T on Fujichrome Sensia 100. Pilgrimage to the Quebec Cartier Railway, July 1997. Getting there was Half the Adventure. By 1997, the Quebec Cartier Railway was among the last places in North America where sets of six-motor Alco-designed diesels worked in heavy daily freight service. Quebec Cartier Railway C-636 number 78 leads a southward ore train in July 1997. This locomotive was one of several Alco demonstrators acquired by the Cartier. Exposed on Kodachrome 25 with a Nikon N90S and f2.8-80-200mm zoom lens. This is a remote and isolated line in northern Quebec that extends north from Port Cartier on the north shore of the Gulf of St. Lawrence into the wilderness of the Canadian Shield. George Pitarys and Bill Linley organized a pilgrimage to photograph this remote operation. Getting there from Massachusetts was half the adventure. The two hour drive to George’s place was the first leg. We rented Ford Explorer at the Manchester, New Hampshire airport, then drove north for about 16 hours. Along the way we collected Bill and fellow photographer Ian at the ferry terminal at Baie-Comeau (they were coming from Nova Scotia.) We stayed at Port Cartier overnight. Our first full day wasn’t blessed with the finest weather, so we focused on some railway activities nearer to Port Cartier, including a tour of the shops of the Quebec, North Shore & Labrador. After that the skies cleared. To reach the scenic areas of the Quebec Cartier Railway requires a long drive on dirt roads into forest largely populated by swarms of man-eating black flies, thirsty mosquitoes and the occasional moose, but very little else. Yet, our efforts paid off. We spent several very productive days photographing loaded and empty iron ore trains in the rugged scenery of northern Quebec. This view was made on our second morning. Conrail SD80MACs Near Middlefield, Massachusetts. Twenty Cylinder Monsters Roar West on July 19, 1997. On July 19, 1997, a pair of Conrail SD80MACs is roaring westward (but progressing at crawl) on the 1.67 percent climb just passed Milepost 130 near the old Middlefield Station location. It is here that the 1912 line relocation rejoined the original 1840s Western Rail Road alignment. (seen disappearing into the trees immediately to the left of the SD80MACs) Exposed on Fujichrome with a Nikon N90s and Nikon 80-200mm zoom lens. Between the mid-1980s and mid-1990s, I made many trips to the old Boston & Albany ‘West End.’ I often focused on the east slope of Washington Hill, where the combination of scenery, ruling grade and traffic patterns was especially conducive to my photography. In 1995, Conrail ordered a small fleet of SD80MAC diesels from General Motors’ Electro-Motive Division. These were Conrail’s first AC traction locomotives and specially painted in a new white and light blue livery. (Later also applied to a small order of SD70MACs). They were also the only modern GM diesel locomotives delivered domestically with the 20 cylinder 710 engine. From early 1996 until CSX assumed operation, pairs of SD80MACs were common on the old B&A route. I made a concerted effort to make images of these machines. I exposed this color slide in the summer of 1997 when the locomotives were still relatively new. A Clear Autumnal Canadian Morning. Autumn is my favorite time to make photographs. Crisp days, rich low sunlight, and bright rusty foliage make for a great combination of conditions. In Late October 2004, Tim Doherty and I spent several days exposing photographs around Montreal. On the morning of October 24, we worked this location south of downtown which featured a shining skyline view. I exposed this image with my Nikon N90s and 80-200 zoom lens on Fujichrome film.